The Lost German Slave Girl was short listed for the NSW Premier's Prize, the NSW History Prize and the Australian Crime Writers Award. Initially Bailey’s plan was to put together a slim volume explaining in non-legalistic terms the petty regulations and day to day controls on slaves in the U. S. His plans unraveled, when one day, in the quiet corner of a law library on a university campus in Louisiana, as he struggled to bring some semblance of order to his unruly and ever expanding manuscript, he opened a volume of the Louisiana law reports for 1845. 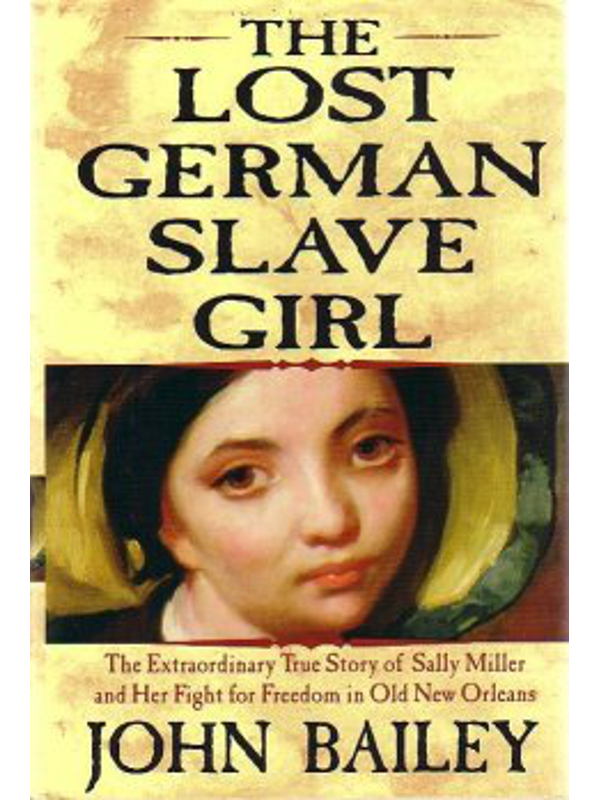 There he met Sally Miller, the Lost German Slave Girl. He was immediately enthralled by her story. By the end of the day, he had shoved his notes on lawyers, judges and politicians into his bag, and opening a fresh page in his diary, began to jot down ideas for an entirely different project - this one, on the saga of Sally Miller’s bid for freedom. The story of the Lost German Slave Girl was one of the most extraordinary cases in slave litigation. When she was discovered in 1843 she was the property of another and working in a squalid cabaret located at the back of the New Orleans waterfront. A succession of German immigrants living in the city came forward to say that she should not be a slave because they knew her as Salomé Müller, a white child, born in a village of the lower Rhine. They swore in court that her father was a shoemaker and recalled the time he had migrated to the United States twenty-five years earlier with his wife and four young children. Litigation about the identity of Sally Miller ran in the Louisiana courts for many years. What commenced as a petition for freedom developed into a trial about the honor of a wealthy Southern gentlemen accused of the heinous misdeed of enslaving a helpless white girl. Bailey spent the following two years in research on the book, making several journeys to Louisiana and one to Germany retracing the steps Sally Miller’s family made on her journey to America. The Lost German Slave Girl was short listed for the NSW Premier’s Prize, the NSW History Prize and the Australian Crime Writers Award. It was published in the U. S. by Grove Atlantic in early 2005. His publishers, Atlantic Monthly, took Bailey on a publicity tour to the US in March for a seven-State tour over three weeks. He spoke at the Tennessee Williams Festival in New Orleans and the Mississippi Conference of the Books in Oxford Mississippi. For me, one of the attractions of writing about Sally Miller, was that I could use her story to illustrate how judges decided issues according to principles of property when that property was human, and how it was possible for white-looking people to be regarded as slaves. I saw myself as writing not only about slavery, but about injustice. I have a theory that when injustice is given cerebral form by the leaders of a community, be they judges, politicians or newspaper editors, it becomes entrenched in the culture of a nation. It is the seductive nature of injustice that often we don’t recognise it for what it is. We are so busy doing what interests us, be it making money, furthering our career and caring for our family, that injustice around us is ignored. When politicians, priests, judges, academics, and writers arrive at a loose consensus to demonise a helpless minority, the climate is ready for acts of exploitation. But it takes something more - the presence of an accommodating middle class which is prepared to reap the economic advantages of suppressing others. When ordinary people became fearful of a minority which is different in colour or religion, and ordinary people become ready to accept moral theories which they know in their heart of hearts cannot be right - by such means is evil justified. By such means are people locked up in Guantanamo Bay without trial. By such means Governments imprison people seeking refugee status, and hold their own citizens without trial for periodic detention. Bailey has the gift of a novelist and a readiness to blend fact and conjecture – fiction, if you will – with the result that “The Lost German Slave Girl” reads like a legal thriller. … What followed is a mystery, and an entirely fascinating one. John Bailey tells her engrossing story, that of her family and the times that shaped their fates with polish and verve, weaving history and mystery neatly together. Along the way, he gives readers a thorough tour of early New Orleans, where raffishness and aristocracy coexisted by mutually ignoring each other. … Bailey cleverly mixes meticulous research with the puzzle of the slave girl’s real identity. He does reveal, at the end, who he believes she was. He has crafted a compelling tale of one woman’s complex life and provided insight into an intriguing and passionate legal battle, and in the process he has given readers a revealing look at one of the darker periods of American history. Bailey, that rare scholar whose writing lives and breathes, ends the book with a daring, Hollywood finish it would be wrong to spoil, but suffice to say that whether Sally was Salome or Bridget, she was born free. It took a nation of millions to make her a slave. Don’t be put off by the clumsy title: this is a marvellous true story, told with all the skill and verve of John Bailey’s earlier book, the widely admired The White Divers of Broome. Bailey’s marvellously vivid account of the legal manoeuvrings, of the successive court trials where Sally’s fortunes continually seesawed, reads like a splendid thriller. … An accomplished writer, [Bailey] provides engaging pen-sketches of the chaos, exhilaration and many horrors of life in New Orleans. … What Bailey himself makes of all this is left - in the manner of the best thriller writers - until the very last page. Dorothea Müller, and unusual birthmarks exactly like her daughter Salomé’s, the Schubers claimed Sally as kin and set about trying to prove her identity as Salomé and obtain her freedom. Bailey brings to life the fierce legal proceedings with vivid strokes. A fascinating mystery obsessed and polarized New Orleans from 1843 until its shocking conclusion in 1849. A close-knit community of German immigrants made an amazing claim: they had seen a young slave woman whom they were sure was the daughter of a relative who had sailed with them from Holland years earlier. After her parents died, the girl and her sister had been sent off to become indentured servants. No one knew what had happened to them, but the community was positive that the slave woman known as Mary or Brigit Wilson was really Salome Muller. Lawyers were assembled, and the battle lines were drawn. The Germans maintained that an unscrupulous former owner, John Fitz Miller, had enslaved an indentured child and later sold her to her current owner. Miller hired a "dream team" to press his claim that Mary was merely a clever slave, duping a bunch of credulous immigrants. Adding to the puzzle was her lack of memory of a German childhood and Miller's inability to prove that he had bought her. Bailey has provided a rich, vibrant New Orleans setting. Using court transcripts, pamphlets produced by both sides, newspaper stories, and biographies, he has produced a courtroom thriller with unexpected twists and turns. The details he includes about the horrors of the immigrant experience, and his discussions of laws governing slave owners, make this a valuable history lesson as well. Bailey brings a lawyer’s eye to the court records and creates a courtroom drama from the raw data. … He deals deftly with his often-inscrutable heroine. … Bailey is a glib and readable writer, and he offers a page-turner of a story. [Bailey] weaves a deft and captivating plot with astonishing detail culled from historical and archival records. Highly recommended. Bailey … relishes telling this remarkable story as the courtroom drama it was, peppering it with fascinating tidbits of Louisiana history and elegant explanations of the law. He fleshes out every angle, every character and pinpoints the legal pitfalls and triumphs with equal zeal. A living, breathing morality tale delivering timeless messages about freedom, truth, and justice … One person is carefully spared critical exposure, however - the woman at the human heart of this story, Salomé-or- Sally. That’s until the last page of the book. Then Bailey finally breaks the suspense, delivering his own unforgettable verdict.